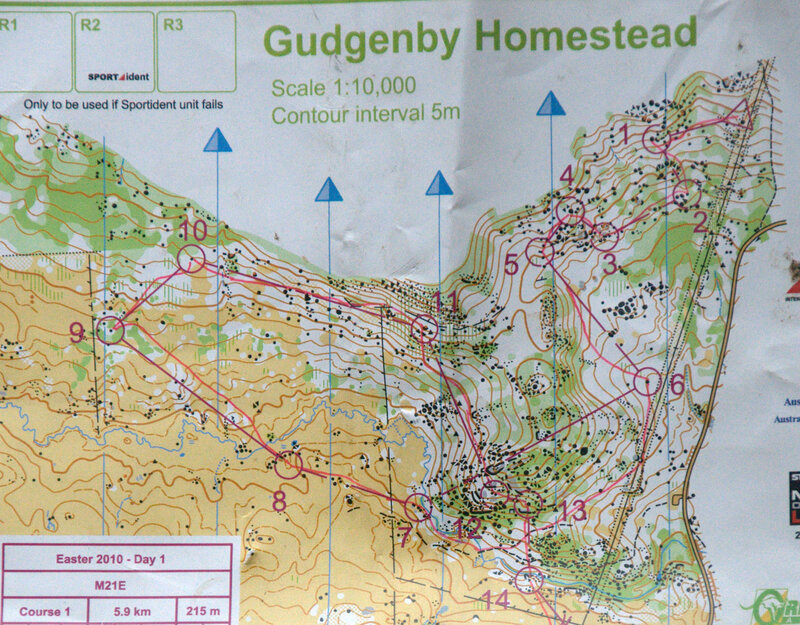 Orienteering in complex terrain can be overwhelming. Here I’ve captured my approach to simplifying some Australian granite terrain. Gudgenby Homestead, in the ACT. 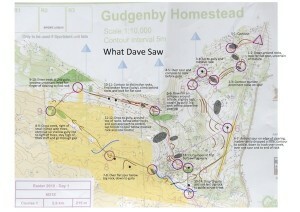 The course segment is controls S-14 from the M21E course from Day 1 of the 2010 Australian 3-Days. My route is also drawn. I have drawn a simplified map showing the most important features I used in each leg. I also indicate my “orienteering speed” in green (fastest), orange (navigating), and red (I think I just have or am just about to make a mistake). Orienteering speed is roughly comparable to running speed, but things like hills, vegetation (and fitness 🙂 get in the way. I have added comments which are partly planning and partly what eventuated. vegetation (trees in the open or thicker stuff in the trees). I made use of more features (and the control descriptions) inside the control circle to ensure I went to the right spot (eg, #12 I crossed the bare rock to drop into the two boulders) but showing all these features would defeat the purpose of the simplification exercise. 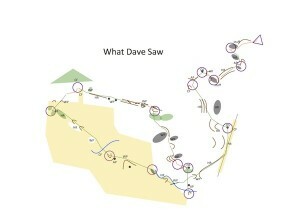 My orienteering was a lot faster when I had good handrails to make the navigation easier. Obvious catching features are good to use but don’t worry too much about looking for catching features (retro-active) if you make use of all the pro-active features. The benefit of way points and attack points is that if you get lost later, you can say confidently “I knew where I was at that point”, and work out what you might have done wrong since then, cutting down the number of possibilities you have to consider.